After seeing little growth in electronic contracting offers and modifications, the General Services Administration has gone back to the drawing board. A new analysis of its eOffer and eMod programs revealed poorly designed applications and resistance to using e-tools. Officials say the agency’s Web applications for creating contract proposals and contract modifications need refurbishing because their use has been well below expectations. Since eOffer went live in May 2004, electronic offers accounted for only 9 percent of all contract offers based on five schedules that allow electronic submissions. Similarly, eMod was used for only 4.5 percent of all modifications submitted during the same period. Those figures appear in an audit report dated March 6 but recently released by GSA’s Office of Inspector General. Auditors attributed the low numbers to lack of support from contracting officers who find eOffer and eMod difficult to use and do not encourage vendors to use them. Michael Sade, assistant commissioner of GSA’s Office of Acquisition Management, said the agency is re-examining how it develops new Web applications. The audit report prompted GSA officials to add an independent verification and validation requirement to its procedures for developing new applications. However, problems with e-tools affect agencies governmentwide. “Not everybody wants to admit that,” Sade said. He added that some employees have little enthusiasm for automation. “Some of what you face with any system rollout is the user acceptance and — dare I say — the generational issues.” However, Sade said GSA has a plan for fixing the problems. GSA’s Federal Acquisition Service officials now hold monthly meetings with eOffer and eMod users to learn ways they can improve the applications. FAS has posted user surveys online to gather feedback. Sade meets with Casey Coleman, FAS’ chief information officer, to review monthly status reports. Officials plan to add eOffer to two more schedules as early as June. IG auditors found that contracting officials and staff members had little enthusiasm for the e-tools because they were more cumbersome to use than paper. Paper forms have clearly marked tabs, they said, whereas e-forms generate confusing links for each uploaded document. The links are unlabeled, and the only way to learn what they are is to click on them, according to the audit. The IG also found it takes more rather than less time to award a contract using eOffer. 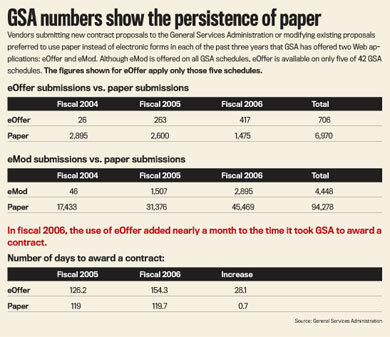 With eOffer, contract awards took an average of 154.3 days in fiscal 2006. Contract proposals submitted on paper also took longer to award in fiscal 2006, but the time from contract offer submission to contract award averaged only 119.7 days, according to the audit. Contracting officers told the auditors that eOffer does not ask for all the information necessary to consider a proposal, which means they have to follow up with companies to get that information. For that and other reasons, the officers said they had little incentive to push others to use GSA’s e-contracting capabilities. Emily Murphy, former chief acquisition officer at GSA, said well-designed e-contracting applications should enable contracting officers to focus on awarding contracts. Other industry experts said GSA made a mistake by not making the use of eOffer and eMod mandatory. “The surprise factor of this story rates right up there with ‘Santa Claus Not Real,’” said Larry Allen, executive vice president of the Coalition for Government Procurement, which represents companies that sell their products and services to the federal government.